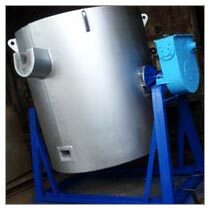 We are a renowned Manufacturer, Supplier and Exporter of Crucible Furnace from Mumbai, Maharashtra. Our clients have the options to choose from a wide range of Crucible Furnace like copper melting furnace, brass melting furnace and Aluminum melting & Holding furnace. Our Crucible Furnace is preferred are widely popular in various countries and used in industries like Die Casting, Molding, etc. We are capable of delivering of Crucible Furnace within a stipulated time. Stationary Furnaces: Provide Electric Holding Furnace for Die casting application & Gas & Oil Fired Aluminum Melting & Holding Furnaces. Tilting Furnaces: Provide Gas fired Crucible tilting furnace with central axis tiling & Hydraulic Lip axis tilting.